Brian Rich, left, and Mark Cieslikowski with the "official sauce" of the 2012 Democratic National Convention. Business is heating up for Mark Cieslikowski, whose vinegar-based barbeque sauce has been named the "official sauce" of the 2012 Democratic National Convention. 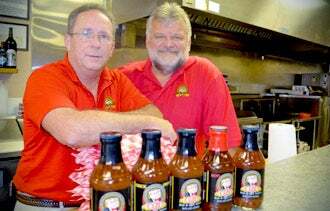 Since May, when contest winners were announced, patrons have been coming in asking for "some of that 'Obama sauce,' " says Cieslikowski, co-owner of Q2U BBQ Pit and Catering in Lake Wylie, S.C. He estimates sales have increased 30%. "We get more people than we ever got before." The presidential candidates aren't the only ones getting a lift from the upcoming conventions. 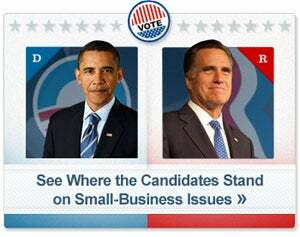 Small businesses in Tampa, where the Republicans are gathering next week, and in Charlotte, N.C., where the Democrats will meet the first week of September, are taking advantage of the upcoming political love fests for candidates Mitt Romney and Barack Obama. The conventions are expected to draw tens of thousands of staff, delegates, journalists and other visitors to the respective areas, providing what is likely to be a sizable economic boost. The 2008 Democratic National Convention in Denver had an economic impact of between $150 million and $200 million, says Suzi Emmerling, a spokeswoman for the 2012 Democratic Host Committee. "While we don't know the dollar amount, we do know it's a lot more business than would have come to Charlotte [over] Labor Day week in a typical year," she says, when asked for a ballpark figure for this year. Meanwhile, the 2012 Tampa Bay Host Committee expects the direct spending impact for the Republican Convention to be about $175 million to $200 million. "This does not take into account the economic ‘multiplier' effect which can equate to 2.5 times the actual amount of hard dollars spent," the committee said in a press release. Many local businesses are doing behind-the-scenes work before the conventions, while other entrepreneurs are anticipating a healthy uptick in business during the multi-day events. In the case of Q2U BBQ Pit, Cieslikowski and his business partner Brian Rich weren't prepared for such a burst of business. The two had been talking generally about expanding, but winning the competition pushed them to double their restaurant's size. "We're just a little barbeque restaurant. There's no way we could have afforded that type of publicity," Cieslikowski says. Even being located about 20 miles from downtown Charlotte in a predominately Republican area hasn't stopped business from booming. In fact, political backlash has been minimal. "If you were a customer of ours and you stopped coming because you think we favor the Democrats, you're the loser, not us," Cieslikowski says. Several businesses say being chosen from hundreds of applicants to work at the conventions has generated a blitzkrieg of attention from media and vendors, which they hope will translate into more business. "It has definitely sparked a lot of interest both locally and regionally," says Melanie Guinn-Buchanan, chief executive of Zander Guinn Millan, a brand consulting firm in Charlotte, N.C., selected to design staff and press badges for the Democratic Convention. Kymberly Brantigan, president of Charlotte Destination Group, is helping to coordinate a shuttle-bus system for thousands of delegates and convention guests. "It is a great sales tool for us going forward," says Brantigan, whose company is also hosting a welcome party for Democratic delegates. Rhonda E. Caldwell, owner of The Main Event Inc., a Charlotte-based event-management company, agrees. "To be able to have this on your resume is a big plus," she says. The company, also chosen to host a welcoming party for delegates, is getting inquiries from several vendors with whom it hasn't already worked, she says. Meanwhile, other entrepreneurs have welcomed little bursts of business. Take Fast Lane Clothing Company Inc. in Tampa, which earlier this summer won contracts worth about $100,000 to supply shirts and hats for some of the convention's security personnel. Not huge, but "every single order helps," says Juan A. Davis, who owns the shop with his wife. Still other businesses are getting ready for an influx when convention-goers arrive. Bojangles' Famous Chicken 'n Biscuits of Charlotte is gearing up in terms of inventory and staff decisions. Eric Newman, the chain's executive vice president, expects demand at its area restaurants to be akin to that experienced during Carolina Panthers football games, when 75,000 fans fill the stadium. Mitch Walker, a partner with Hurricane Grill & Wings in Tampa, estimates business will be up 30 percent as a result of Republic Convention traffic. The restaurant is located in a Ramada Inn, where hundreds of members of the production team and security are expected to stay for two weeks. Walker says he'll rely on existing staff to work longer hours. He's keeping doors open from 7 a.m. to 2 a.m., instead of the usual 11 a.m. to 11 p.m. "It's just one of those deals when it's going to be a long week for everybody and we're just going to prepare for it," he says. Meanwhile, like a presidential candidate, Q2U BBQ Pit's Cieslikowski is pledging great things, post-convention. He hopes to stock national supermarket shelves with his prize-winning sauce. "I don't see us doing anything but growing at this point," he says.